Hiking shoes have the job of making sure your feet still feel great after a long hike. There are lots of factors that contribute towards getting great footwear for expeditions, from the support to the fit. Here are some of your common questions about walking shoes answered, to help you get the most out of this useful type of footwear. Hiking shoes are used for long walks and challenging treks. They are better than other shoes for hikes, mainly because of the tread on these specialised shoes. The tread allows your shoes to grip uneven surfaces to prevent slipping, whilst most other shoes have a light tread which won’t help give serious walkers the grip they need. As well as tread, hiking boots also offer a large amount of support to the ankle and stiffer midsoles. This helps your feet and ankles when walking on uneven surfaces, especially if your ankles sprain easily. It is easy to assume that walking shoes are the same as hiking boots. Although they are similar as walking shoes help provide the feet with extra support when walking, they usually don’t have as much tread as hiking boots, so are not as good for uneven surfaces. Some hiking shoes are waterproof, which help when walking through streams and mud, others have several layers that do get wet, however, because of the layers, they dry quickly. Both of these shoes are great for changing conditions, whereas walking shoes will get wet and stay wet, carrying around that water for a while which may make them uncomfortable and heavy. Selecting your hiking shoes is all about deciding what kind of trips you go on and what kind of footwear will suit your needs. If you do slow day rambling, low cut models with flexible midsoles tend to be sufficient enough. Walking shoes can work well if you only go for short walks, on nice dry days over terrain that tends to be flat instead of hilly. If you are going for a long excursion and you’re expected to walk on uneven surfaces, hiking boots are best. Hiking shoes usually have ankle support, however, the higher the cuff goes, the more support the shoe will give your ankle, naturally. Higher cuff hiking boots are better for uneven surfaces as they will protect your ankle from being twisted and sprained. Some hiking shoes also have a steel toe to add extra protection, but for the majority of the time this is not needed and may even make your feet less comfortable on your trek. If you’re just starting out hiking, lightweight shoes are better as they’re not adding an extra weight for you to carry. The lightest hiking shoes usually have a low cut and flexible midsoles. Choosing the rest all depends on what you need from your shoes and what type of hiking you do. If you’re planning a long trek, you might want more lightweight shoes, especially if you have to carry a full backpack. However if you are going on a challenging hike, with uneven trails and are going for a while, more heavy weight boots will be best for supporting your feet and ankles. Walking shoes should fit snug around your feet, although you should have room to wriggle your toes. If your heels rise when walking, the shoes are too big for you and won’t support your feet and ankles properly. You should try on hiking shoes later on in the day, this is when your feet tend to swell the most, like they would if you were hiking. When trying hiking boots, wear the socks you would wear for walks and try to walk around the shop, this will help you to figure out if they are the right ones for you. Sometimes hiking boots might be too wide for your foot, if this is the case try a different style for a better fit. You shouldn’t need to stretch your walking or hiking shoes, if you feel like you would need to, the shoes are too small and it’s worth trying a size up. Most walking and hiking footwear has a lace up fastening so this will help you to get a good and secure fit. You’ll find they often have long laces so you can try some different lacing techniques to get the best fit for you. Lacing should be taught but not extremely tight to correctly support the foot. Hiking boots can go with all sorts of outfits; from dresses and tights to jeans or shorts. They are usually fairly neutral colours, so they can easily go with your favourite pair of jeans. Put a pair of skinny jeans on with your hiking boots and make them look a bit more glam. Or add some comfy leggings with a jumper or shirt of your choice and look comfy but stylish. Add colour to your outfit with some bright socks, or add some thick tights and a bright skirt. There are so many ways to style this sturdy footwear, but essentially comfort is key when you’re travelling some distance on foot. To clean your hiking boots, you need to get all the dirt out of the fabric. You can do this by using a brush, something like a toothbrush will do. You don’t want anything tougher than that because it will affect the fabric of your boot. If the brush alone isn’t enough to remove the dirt, try adding some water and specialised shoe or boot cleaner, if you don’t have any of this, try using saddle soap or a very mild washing up liquid. Avoid using any type of bar soap or other detergents. Take the laces out and clean around the holes for the laces, these can keep dirt trapped. 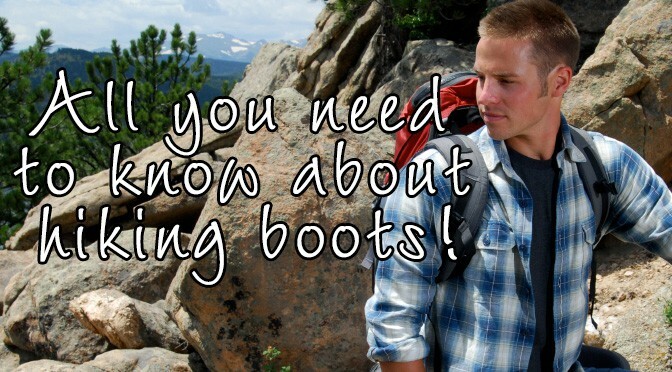 We suggest cleaning your boots after every hike to keep them fresh and new. To make your walking or hiking boots water proof, you can easily find fabric and leather proofing spray. This is usually a spray that you apply to your shoes, let it dry and if will stop your boots from soaking up the water. Walking shoes are worn out when the sole is no longer protecting your feet from the harsh ground, or they are not supporting your ankle as much as they should be. You should replace walking shoes when they no longer do the job of protecting your feet and ankles or they no longer feel comfortable. This time changes for every person, it depends on how often you use them, how long you use them for at a time, what kind of hikes you go on and the brand of your shoes. If you look after your hiking boots, keep them in good condition and clean them after every hike, they can last you a long while. If you like to enjoy the great outdoors, investing in some good and supportive footwear is certainly worthwhile.